For this kind of measurement, we are equipped with special instrument – Olfactometer TO8 made by Ecoma and vacuum sampling instrument. Before determination of odour particles concentration, the sampling take place. This sampling is made at sampling site into sampling bottles made from suitable materials, utilizing special vacuum sampling machine. The samples are then transported to laboratory. During sampling, climatic conditions are monitored. We are authorized by MŽP to measure emissions of odour particles according to law No. 201/2012 Sb. (Zákon o ochraně ovzduší). 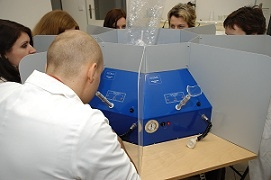 Determination of concentration of odour particles is made by Olfactometer TO8. This instrument works on principle of dilution of sample with neutral air. The sample is sucked from samping bottles and is mixed with neutral without odour air in gaseous pumps . This adjusted sample is then submitted to the comission members. Value of limit concentration determined by measurement is that, that is determined by 50 % of comission members and it is related to determined diluting ratio. By this ratio is concentration of odour substances defined as equal to1 OUER/m3.